So the old saying goes, 'To be great, surround yourself with greatness.' For 24 year old Chantelle Cameron she's certainly on the right path. A former kickboxing champion, she converted to boxing at the age of 18 and six years later she is a veteran of the GB Podium setup in Sheffield, overseen by trainer of former world champion Carl Froch, Rob McCracken. It's been a whirlwind of activity that has seen Chantelle reach the precipice of amateur boxing, a place at the Olympics and the opportunity to return home with a much coveted gold medal. So how did it come about that the girl from Northampton who was so adept and successful at kick boxing translate her skills over to the world of boxing? "I started kick boxing when I was ten and also did a bit of Thai kick boxing" Cameron tells me. "I switched to boxing at 18. I actually never really wanted to box, I wanted to kick box because I had done it so long and loved it. But when the Olympics was mentioned I thought it wasn't an opportunity I might not get again. I was champion at kick boxing and I wanted to make sure I brought something else to the table. Most kick boxers aren't great with their hands - my legs were average and I relied upon my hands. I went to a boxing club to make sure my hands were even better. I think it was in the first month my coach wanted me to box but I wasn't sure. Then I boxed and after my first few bouts I won the ABA Nationals." It was after the success at the ABA championships that the callup for the England team occurred which although a huge privilege and honour for the then 18 year old, it also left her with a tough decision to make. 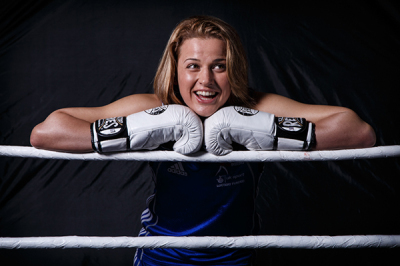 "Because I was selected for England they made me pick between kick boxing and boxing. My kick boxing coach actually told me to go into boxing. I was literally heart broken when I left. I was only 18 and felt like I was betraying my coach, but he was the one that told me I had an opportunity and to think of my career and the life ahead of me. Now I'm sat on the GB squad so I owe him a lot" she says reflectively, passing on the gratitude for the guidance provided on her journey. With the prospect of the Olympics on the horizon, this week Chantelle will be flying out for a taster of what it could be like if she secures a qualification place. Hand picked by event organisers, she flys out to participate in a trial event utilised to give organisers an idea of the logistical road bumps they may face and equally as important, a unique opportunity for those selected to sample some of what the Rio Olympics will feel like next year. So how much does she know about what will take place during the test event? 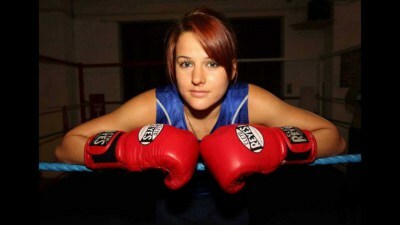 "I'll have three bouts while I'm there which will be a trial of what the Olympics will feel like and be like. I'm really excited for it, I haven't been this excited for a long time!" Cameron tells me with the glee in her voice of a child who has realised Christmas in fast approaching. So given that this is a test event and there are no medals at stake for the winners, how seriously is Cameron taking her preparations? "I'm taking it seriously, but I was only told less than a week ago that I would be going. I've been in training anyway thankfully. I've been doing work with my coach on the things I need to work on but it would have been better if I had more time to prepare. I have no idea who I will be fighting as it's invitation only, I'll only find out when I'm there and see what countries are there. It's only 60 boxers in total, that's men and women, so they've hand picked certain people. There's six of us from Britain going; me, Lisa Whiteside and four of the GB lads." The test event is one thing, the real Olympics quite another. As it stands at present, Chantelle is in the prime position to secure herself a place in Team GB as the representative in the women's 56-60 KG boxing category. However, with the qualification places decided only a short time before the Olympics take place, she is aware that this is no time to be resting on her laurels as she explains. "You get two shots to qualify, the Europeans and the Worlds, which are both next year. I don't automatically get the place, it's whoever Rob McCracken selects to go and box for the qualifiers. I'm on the squad already so I need Rob to pick me. I'm confident, as I'm the one performing and bringing back the gold medals, but I'm not going to be complacent. The qualifiers aren't until April so I have to keep training and working hard. The Europeans are first and then the World championships are a month later. I'm hoping to be picked for both. One tournament will be harder than the other, so it's only fair that if you're number one and have a chance of qualifying you should be sent to both, providing you're fit and healthy." Being a part of the GB Podium squad is a commitment for any fighter. The role involves Chantelle spending Monday to Thursday away from her home town of Northampton and relocating to Sheffield where the squad are put through full time training. The setup has reaped huge rewards, with Olympic medals being secured for the likes of Anthony Agogo, Luka Campbell, Anthony Joshua and of course, the ever smiling Nicola Adams. Each of them has come through the system in Sheffield under the guidance of McCraken. This is now the sixth year for Cameron being involved, so how does she handle the time away from home? "It's just routine now. It's a lot of discipline and I'm away from home all the time - that doesn't faze me anymore" she tells me, almost nonchalant about the sacrifices needed to make it to the pinnacle of her chosen sport. She tells me about the trips still made by Anthony Joshua to the training centre, how he performs feats of a super human nature while in training for his December 12th showdown with heavyweight rival Dillian Whyte. It was the Olympic gold medal in 2012 that propelled the now unbeaten professional to public consciousness, and yet his next fight is one that harks back to his old amateur days against a rival who not only beat him, but in the process managed to drop the heavy hitting Joshua. So how does he look in training for the big showdown? "When you see Anthony Joshua running and training you think 'wow, what an athlete'. Just this morning alone he was doing his sprints and he's so fast and so big it's just.....wow, he's an inspiration. He's a really nice guy and humble too which I like." So how does she see the outcome when her former GB teammate Joshua comes head-to-head with Dillian Whyte? "I think Anthony will win. Amateur is a lot different to pros and he's got all the tools to beat him" she tells me, confident that Joshua will continue his unbeaten streak at the O2 arena in the Christmas buildup. There is another Olympic gold medallist that we discuss, a person who has achieved nearly all that there is within the sport of women's boxing, Katie Taylor. The 29 year old from Ireland has taken home gold medals from the Olympics, the World Championships, the European Games and European Championships. Seen as the elite of the sport, has Cameron's path ever crossed with that of Taylor before? "She's in my weight division. I boxed her in 2011 and she beat me, obviously! It was my first year of boxing and I think it was my second or third international. I can't wait to box her. Every tournament I go to I tell my coaches I can't wait to box Katie. Not because I'm cocky or confident, I want to see how I do against her. In 2011 I held my own against her, even her team said it was a good match, and I was nowhere near as experienced as I am now and definitely not as good a boxer as I am now. I really just want the chance to box her." That chance may present itself if both are able to successfully navigate their routes to Brazil next year. With places at a premium and the standards being so high there is no guarantee that the two will get to replay their 2011 meeting, but if they do it is sure to be an exciting affair and one that would capture the public imagaination. However once the dust settles on the Olympics next year and, all being well Chantelle not only qualifies but travels home with a medal, has she thought ahead to what may lie in her future within the sport? Afterall, the British Boxing Board of Contraol have been notoriously slow to embrace the idea of allowing women to compete professionally in UK boxing rings. Cameron is happy to explain her aspirations. "I would love to turn professional but there's nothing in it for women at the moment. 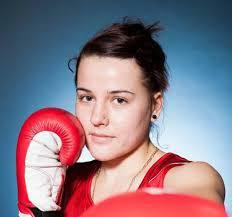 In Germany it's pretty big but in England you don't hear a lot about professional women boxing, it's very quiet. It's a shame as well because I think my style would suit the pros. I've spoken with my coach and would like to stay amateur for a while, maybe another year or two, and then I'd like to go abroad to somewhere like America maybe. I wouldn't mind going to a different country and would probably love it in America! I'm used to not seeing my family now." America, the land of opportunity, also has some other doors that may open up to expand Cameron's career. With a history as a successful kickboxer and now the opportunity to add boxing medals to her haul, perhaps there is the potential for a move to the world of Mixed Martial Arts (MMA)? "People say to me that after the Olympics I should do MMA and I'd be good but I just think 'I've never done grappling and I've never been thrown about!'. I could be good at it but I don't know as I've never actually grappled." The highest profile female combatant in the world of MMA is without doubt Ronda Rousey. The American fighter only this month lost her bantamweight title to Holly Holm in a shock result that took the fight world by surprise. Holm though was no flash in the pan, herself a former female boxing champion with a history in kickboxing. On the night it was her southpaw stance and superior boxing skills that befuddled the previously unstoppable Rousey. Given that there are such similarities between herself and Holm, does it inspire Chantelle that perhaps it may not be a pipe dream to make the switch? "I watched the bout and all respect to Holly Holm because she did what she needed to do but I was thinking 'I have that level of boxing skill, that could have been me'. I did actually sit and think I could have won that because what she did was box her, she outclassed her. Knowing my luck I would have got put down and got my arm snapped! Ronda, even though she lost, I think she's an amazing athlete and has inspired me. I have always watched it and wanted to do it because of the stand up attacks in it, it's just the grappling I don't think I'd be any good at." There is still the hope though from the Northampton fighter that her new found love of boxing will embrace the concept of women being allowed to compete in the professional ranks like their male counterparts. Attitudes are adjusting, as she acknowledges. "The view is changing all the time, people always used to speak badly of women's boxing. But now even coaches are accepting it. There are some older more traditional coaches who wouldn't want a woman in the gym whereas now they're doing women's only fitness classes. It's changing so much, but changing for the better. There's always a plan B so I need to keep my options open. Who knows, professional women's boxing could be a reality in 2017." 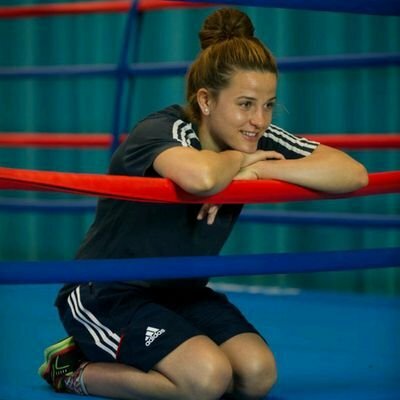 Chantelle speaks fondly of her time training alongside the males in the GB squad and tells me how for her, sparring the men helps her raise her game. Are they gentlemen though who refuse to hit a woman, or is everyone fair game once they strap the gloves on and get between the ropes? "They are conscious of hitting a woman. Sometimes they don't really want to hit us, but then the coaches are like 'do something, hit back!' They don't go full power but they give you a good spar though. I love sparring the boys as they always get the better of me. With the females, without being disrespectful, I can switch off a lot easier. When you're sparring with the boys, if you switch off you're going to get beaten up!" she laughs, clearly not adverse to taking the punches off the boys. There is no doubt that Chantelle Cameron has a bright future ahead of her. Whether that involves claiming her place at the full Olympics next year won't be clear until qualification places are fought for and secured. It may be that the old school views of the British boxing establishment force her arm into another discipline where she would have to learn how to force someone else's arm. Given that by the age of 24 she has already achieve huge success in two sports, it is not unthinkable that the likeable girl from Northampton could go on to win honours in other after boxing. If that is the route she takes then it would be GB boxings loss, along with the fans who cry out for a professional setup in England to allow women boxers to show off their skills. For now though, her focus is fully on qualification and medals at Rio 2016. The test event she flys out to this week could provide just the inspiration she needs for a busy year ahead. Chantelle wanted to thank her sponsors Opus Energy and is open to other sponsorship offers from local business to support her boxing career.